Mumbai: In the wake of the ongoing global credit crisis and a muted Diwali in terms of consumer spending, global and local media buyers and market research firms are scaling down their projections of marketing and advertising spending by companies in 2008-09. Many of these firms expect things to become even more difficult in the coming months. According to a recent poll by marketing consultancy firm R3 of at least 50 marketers who manage around 100 of Asia’s top 500 brands, three out of every four Indian companies will spend on marketing in 2008-09 as much as or lower than what they did in 2007-08. And a study released recently by media specialist Zenith Optimedia said growth in advertising budgets in India in 2008 would be 4.5% (over the previous year) compared with a 24.5% growth in 2007 over 2006. At least 30 marketers covered by the R3 survey work for Indian companies or companies operating in India. “The events since the credit crunch have hit marketers hard," said Greg Paull, co-founder, R3. Paull predicts there will be significant reductions in marketing budgets in the coming year, even in growing markets such as China and India. R3 initially conducted its survey a few months ago and at least one in two Indian marketers said then that their marketing and advertising budgets in 2008-09 would increase. “That’s changed now," Paull said. In October, R3 contacted the same marketers. About half of them said their marketing budget would fall by 10% with one-fourth of them saying that it could fall by at least 20%. “Predicting the future has never been more challenging," Paull said. He added that at least 40% of Indian marketers said they were going to spend more than originally planned on digital media, direct media and promotions. The Zenith study, however, predicts that 2009 and 2010 will be better years for India in terms of advertising budgets, which it expects to grow by 13.5% and 12.9%, respectively. These figures are pegged at “constant 2007 prices" or figures which have been adjusted to take general consumer inflation into account, said Jonathan Barnard, co-author of the global study. Not all advertising growth is driven by the economy, added Barnard. “Ad expenditure growth is only partly explained by economic growth. Technological change (such as the spread of digital TV and the Internet), government regulations and the launch or closure of media vehicles such as new newspapers or radio stations all affect expenditure as well," he said. Advertising budgets as a proportion of the country’s gross domestic product will continue to rise in India from 0.57% in 2008 to 0.63% in 2010, the Zenith study said. In the US, this proportion is expected to shrink from 1.27% in 2008 to 1.23% in 2010. In India, the first definite signals of advertising budgets shrinking came around Diwali, said experts. “This Diwali season has definitely been lacklustre compared to last year. October 2008 overall ad spends has been approximately 14% below October 2007 spends," said Chandradeep Mitra, president of Mudra Max. Others experts put the fall at 30-40%. A large number of categories which typically spend heavily during this season have cut their budgets this year, said Mitra. These categories include cars, two-wheelers, televisions, cellular phone services, ready-made garments, paints, life insurance firms, airlines and retail firms. This has been compensated to an extent by the entry of new categories or advertisers such as direct-to-home television services, fixed deposits, mobile handsets and beverages. Mitra added that there has been little change in the spending of consumer product companies. Next year, political advertising ahead of the elections and advertising drawn by the second edition of the Indian Premier League would add volumes, he said. Mitra added that advertising budgets would grow in the single digits in 2009. Divya Radhakrishnan, president, The Media Edge (TME), the media arm of advertising agency Rediffusion DY&R Pvt. Ltd, said much of the reduction in advertising budgets this year is happening in areas such as consumer products and jewellery, which typically do not advertise after Diwali. By February or March, companies in the businesses of beverages and air conditioning would start advertising, Radhakrishnan said. She too expects to see a fillip from political advertising, and a slowdown in financial advertising that typically peaks in March. Anil Nair, president, Law and Kenneth Worldwide, said that the situation in India would not be as grim as that in the US and Europe. However, according to Nair, real estate advertising will dry up completely in 2009. Financial advertisers will slash their spending by 30-40%; aviation firms will reduce their spending by at least 40%; and automobile companies by 15%. Nair said only consumer product and telecom companies would maintain their budgets at 2008 levels. 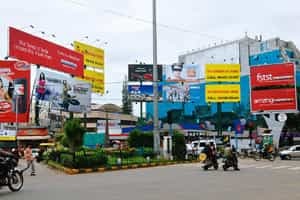 Sudarshan Rajan, business director of Mumbai-based media specialist MediaCom, said the advertising market had shrunk by 15% this year and could fall by 22-25% next year. Ravi Kiran, CEO (South-East and South Asia) of Starcom MediaVest Group, however, said that while the advertising market will grow by only 8-9% in the early part of 2009, it will pick up soon after the elections. New entrants in the telecom business will also contribute to growth. Kiran added that large companies would try to strike multi-year deals with media firms. “This is something people have been talking of for a long time, but action has lagged intent. Smaller marketers will try to shorten the deal cycle. We believe clients will place greater emphasis on agencies’ organizational strengths, processes, systems and tools... Big agencies will benefit, as clients try to come under a bigger umbrella when it rains hard."